Across Tennessee, 62 people have been injured in accidental shootings in 2016. Tennessee is on pace for a large increase in accidental shootings this year, according to the Safe Tennessee Project. The group tracks firearm incidents like the one Tuesday in Nashville in which a 3-year-old injured himself. Nashville police said the boy shot himself in the wrist with a pistol his 24-year-old father carries as a security guard. The two had just gotten home and put down their backpacks, when the boy pulled the .40-caliber gun out of his dad’s bag and fired once. The father quickly rushed the boy toward the hospital before encountering a Metro officer who called an ambulance to finish the trip. Within hours, Beth Joslin Roth, of the Safe Tennessee Project, performed a sobering task — she logged these particulars into her accidental shootings database. “Often times, it is young children that are finding these loaded guns. Preschoolers, toddlers. They’re little kids. Little kids are curious,” she said. 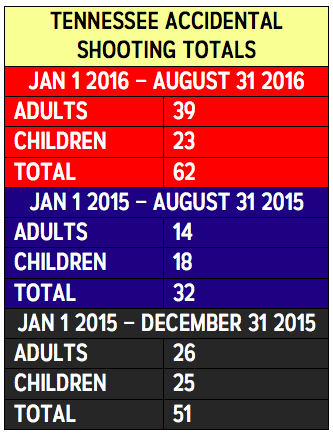 These tables compare the year-to-date accidental shooting totals for 2015 and 2016 (and show the entire 2015 total in black). According to the group’s records, seven children have died this year and there have been 62 accidental shootings in total. That’s more than in all of 2015 (51) and part of an upward trend for several years. Data from 2013 ranked Tennessee ninth in the nation for the prevalence of unintentional shooting injuries. The Safe Tennessee Project pays such close attention because accidental shootings are preventable, Roth said. Her group preaches safe storage (view Metro's gun safety page) and pushed unsuccessfully for a tougher penalty against parents who mishandle guns. “Responsible gun owners understand that guns must be kept safely stored at all times,” she said. The father in this week’s case has not been charged. As Metro Nashville begins hiring teenagers for seasonal summer jobs there’s a big push to hire more than in recent decades, and for a wider array of positions — a major prong in Mayor Megan Barry’s plan to reduce youth violence. One government department — Metro Parks — could be the one to account for much of the expansion. Tennessee has one of the highest percentages of children who have had a parent in jail. In raw numbers, that’s 144,000 kids, according to the latest “Kids Count” study, which tries to tally the impact on future generations. Operation Safer Streets is the Nashville police program that has drawn some of the most specific criticisms from Black Lives Matter Nashville this month. While the department defends the operation (detailed below), the tension reveals a complex question: Does an increased police presence make a neighborhood safer? Tennessee lawmakers took major steps toward opening all parks in the state to guns, but a Senate panel put off more ambitious legislation sought by gun lobbyists.